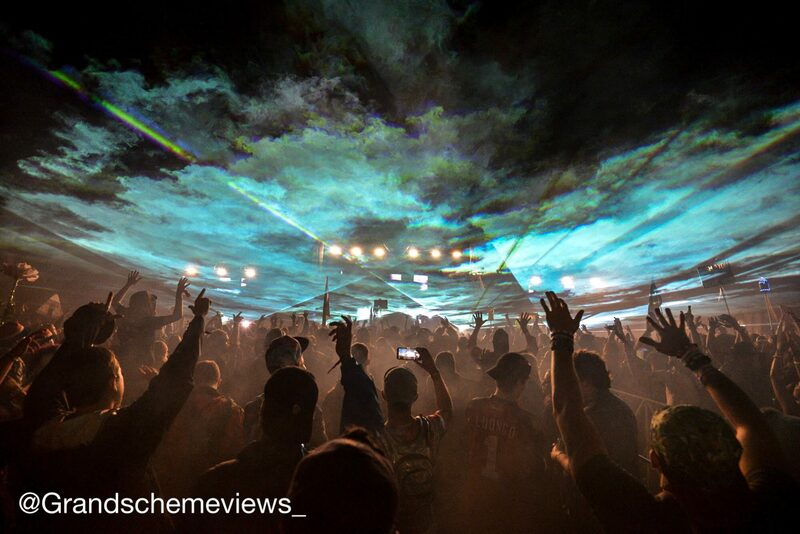 The beautiful Backwoods Music Festival is here once again, and this time around we unite at Mulberry Mountain in Ozark, Arkansas on May 31st-June 2nd. Backwoods has always had a history of dope lineups, but 2019 is set to be its biggest year yet, the full lineup can be seen in the graphic below. 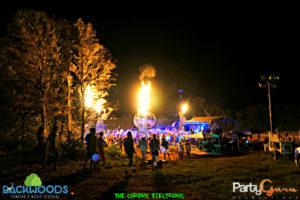 The festival has also experienced a few venue changes, but attendees in the past are content with Mulberry Mountain and feel that it fits the festival’s needs perfectly. This notion is further solidified by the fact that Liquid Stranger’s inaugural Wakaan Festival will take place at Mulberry Mountain as well! 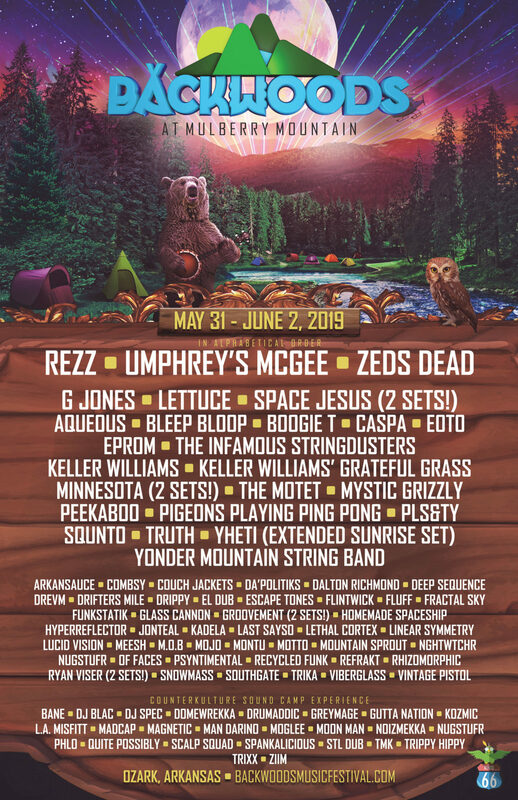 Backwoods’ phase one announcement teased and pleased, but phase two’s additions of Zeds Dead, G Jones, CASPA, Keller Williams’ Grateful Grass, and not one but TWO Minnesota sets (plus a few more names) really iced that already wondrous cake. 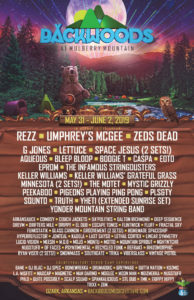 The complete lineup includes: REZZ, Umphrey’s McGee, Zeds Dead, G Jones, Lettuce, Space Jesus (2 Sets! 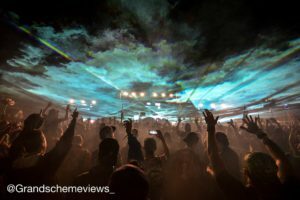 ), Aqueous, Bleep Bloop, Boogie T, CASPA, EOTO, EPROM, The Infamous String Dusters, Keller Williams, Keller Williams’ Grateful Grass, Minnesota (2 Sets! ), The Motet, Mystic Grizzly, Peekaboo, Pigeons Playing Ping Pong, PLS&TY, SQUNTO, Truth, Yheti (Extended Sunrise Set), Yonder Mountain String Band, Arkansauce, Combsy, Couch Jackets, Da’politiks, Dalton Richmond, Deep Sequence, Drevm, Drifters Mile, Drippy, El Dub, Escape Tones, Flintwick, Fluff, Fractal Sky, Funkstatik, Glass Cannon, Groovement (2 Sets! ), Homemade Spaceship, Hyperreflector, Jonteal, Kadela, Last Sayso, Lethal Cortex, Linear Symmetry, Lucid Vision, Meesh, M.o.b, MOJO, MONTU, Motto, Mountain Sprout, NGHTWTCHR, Nugstufr, of faces, Psyntimental, Recycled Funk, Refrakt, Rhizomorphic, Ryan Viser (2 Sets! ), Sn0wmass, Southgate, Trika, Viberglass, Vintage Pistol, Bane, DJ Blac, DJ Spec, Domewrekka, Drumaddic, Greymage, Gutta Nation, Kozmic, L.A. Misfitt, Madcap, Magnetic, Man Darino, Moglee, Moon Man, Noizmekka, Nugstufr, Phlo, Quite Possibly, Scalp Squad, Spankalicious, STL Dub, TMK, Trippy Hippy, Trixx, and Ziim. The festival has a history of hosting a wide range of mostly electronic genres, and sprinkling in a few instruments in the form of jam bands as well. Personally, we are most stoked to see REZZ, Zeds Dead, CASPA, both Minnesota sets, the extended sunrise Yheti set, and a multitude of new smaller artists we have yet to discover! Pack your bags and meet us at the mountain! Check back soon for an unofficial Backwoods Playlist with all the artists performing on it. 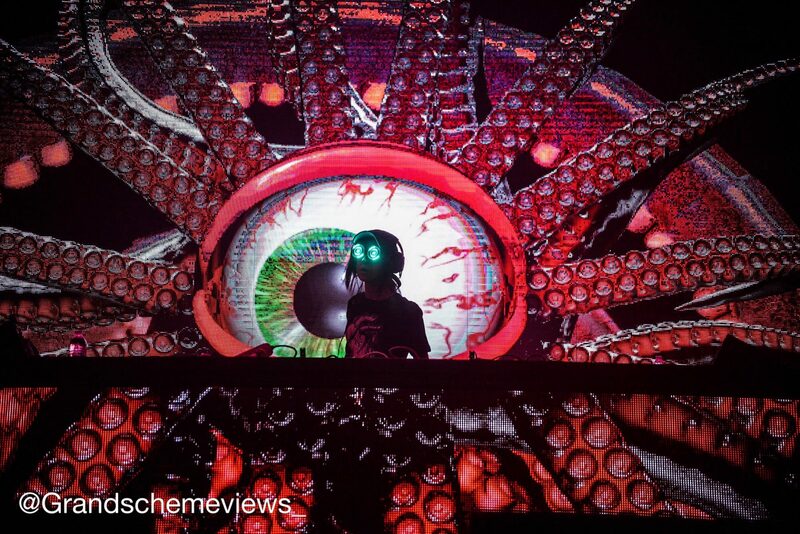 This entry was posted in Uncategorized and tagged Backwoods, Backwoods Music Festival, Rezz, Zeds Dead, Ziim. Bookmark the permalink.